"Tribalism determines whether deals go through or burn to the ground. Sometimes people prefer hiring from their own tribe and doing business with people from their own region. They do this not because they are evil, but because they are more comfortable sticking with the familiar." 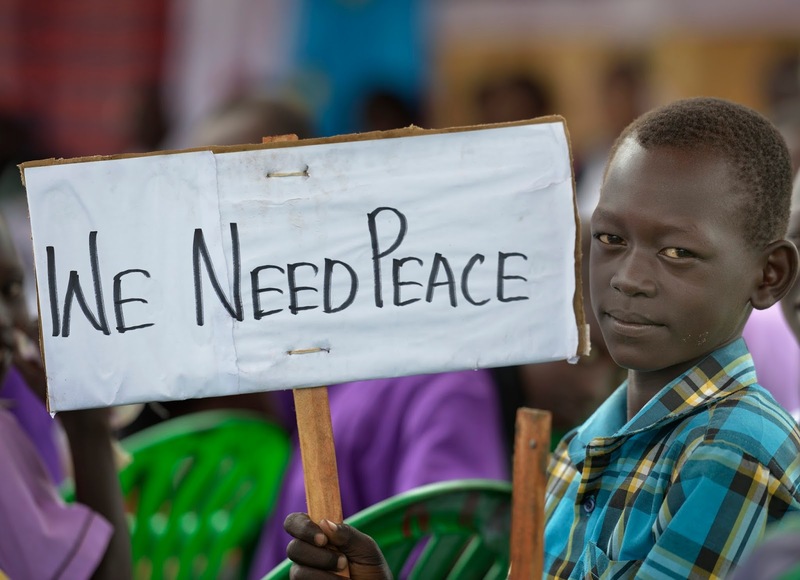 Peace is the only option for the stability to be maintained in South Sudan; why don't we do it South Sudanese? It is we to make this possible because everything is possible with people when it is taken as an inclusive phenomenon. 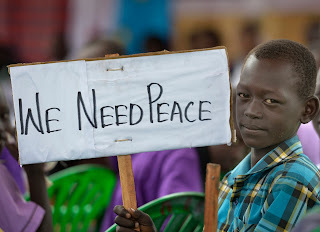 If we make our demand for peace the order of the day showing our interest for it in every area of our lives including workplaces and make discussion with our nearby fellow South Sudanese, then I am sure peace would prevail in our country. Let’s shout out loud that "we need peace back to our nation" because peace is the very precious word ever that is followed only by the thrilling events whenever people consider it as an inducer of brotherhood. Our people are now divided with their plans engulfed by intending to kill Mr. X because is the member of that tribe who are our enemy which obviously abolishes brotherhood among South Sudanese. This is the time, a time to leave blames, hate and tribalism behind and find an alternative solution model that can bring us back to our unity, which we had during our struggle against the neighboring North for the independence of our country. Hence, this alternative is peace. Fellow South Sudanese, our country is reaching lethal stages of crisis that will not only affect us but also our future generations in our beloved nation if we don't cease this current civil war. Our country is for all of us, so none of us owns South Sudan and none of the tribes is superior nor inferior to the other. Imagine a world where political and ethnic division are the norm. A world where tribalism thrives as intensely as corruption. That world is Africa. When we say tribalism, we do not mean a fashion print - we wish we did. Here, tribalism is the act of judging and condemning someone solely because they are from a certain tribe or social group. Ridiculous, right? In Morocco, if you're a Berber, you're Scroogelike; if you're a Fassi (from Fez), you're a snob; and if you're a Jew, you're too calculating. Whereas in Kenya, if you’re a Kikuyu, you’re overly greedy; if you’re a Luo, you are very extravagant in its purest form; and if you’re a Kisii, then you need anger management classes. Likewise, in South Sudan under President Kiir Mayardit's regime, if you are Dinka you feel it better. No need for a Ph.D. to see that these stereotypes are way off the mark. Here, your origins determine how others see you. Racist jokes don’t seem that racist and your accent is too funny to ignore. Clichés may be fading but their effect is not. The social divisions in our society prevent people from seeing beyond your surname. For instance, in South Sudan, if you introduce yourself as Rose, it is not uncommon to find people asking, ‘Rose who?’ If you decline to answer, then the question becomes, ‘Rose from where?’ Tribalism makes people judge you by the language you speak rather than by your personality. The absurdity of it all makes you wonder when the hell you made an application to God personally, requesting to be born into a particular tribe? Rwanda is - unfortunately - a good example of this. The widely-known version of the story is wrong. Hutus and Tutsis aren't tribes. Hutus didn't kill Tutsis just because they hate their guts. Throughout history, imperialist countries made either the Hutus or Tutsis a comprador class of elites. Tensions grew more intense as years passed by. So, through a mix of external pressure and a strong sense of ethnocentrism, genocides were committed. It’s well-known that elections in tribal nations aren’t these countries’ pride. Kenya, Rwanda, Burundi, South Sudan, Somalia and many others, suffered from post-election violence due to tribal tensions. Votes aren’t based on ideological affiliations or preferences but on tribal identities. It is deemed as a social duty to be loyal to one’s tribe. The voters do not care whether you are a drug dealer, a murderer, a saint, a corrupt narcissist, a peacemaker, or even the devil himself. If you belong to the right tribe, the post is yours. South Sudan has always been rich in human and natural resources. However, we haven’t reached our full potential. Unity is what we lack. So obviously, tribalism and ethnic conflict aren’t the best strategy. People starve, get sick, die, and lose loved ones. When you’re famished, sick, let down or dead, you hardly ever think of getting an education, fighting for Africa or finding the solution to your country’s social or economic issues. Tribalism determines whether deals go through or burn to the ground. Sometimes people prefer hiring from their own tribe and doing business with people from their own region. They do this not because they are evil, but because they are more comfortable sticking with the familiar. This, however, locks out better suited and more experienced individuals who could have been a better fit for a company. Tribalism is, therefore, a hindrance to development. You know the saying, ‘You can’t choose who you love?’ Well, you can. You should. You will. And you must. You simply cannot fall in love with someone who is not from your tribe; that is an abomination. Don’t even toy with the idea. Unless you are begging to be cast out by your family. Tribalism prohibits you from freely exploring and experiencing a culture different from yours. However, with every cloud comes a silver lining. We are becoming more tolerant so let’s start realizing that just because someone does not practice your culture or speak your language, they are not less of a human being. My fellow citizens, let us join hands as brothers and sisters to give peace a chance and indeed see how good it is when a country is peaceful. Today is our new chapter in life so, let's leave all the mistakes behind and concentrate on our brighter future in the republic where any one of us will maintain equal opportunity in doing whatever can benefit him/her in favor of the prosperity of our nation. Let us build love among ourselves irrespective of the tribe in which we belong and at least looking forward to the future of our nation. Yien Wil Mayuak is a South Sudanese who is currently staying in Jimma, Ethiopia and can be reached via his e-mail at gatwiel2017@yahoo.com. Editor's Note: The views expressed in this article belong to the mentioned writer not "The Philosophical Refugee."